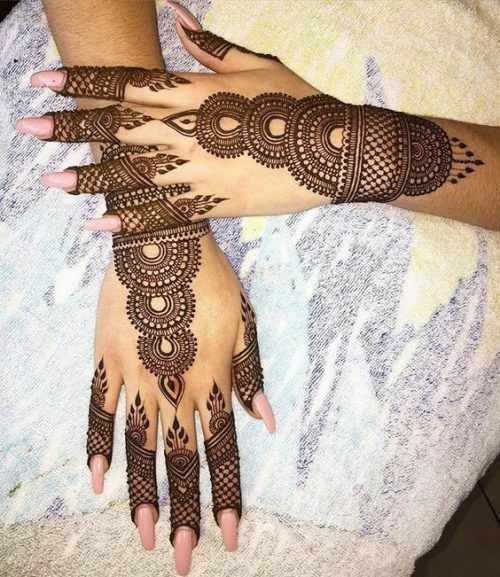 30+ Arabic Mehndi Designs For The Brides Who Want Something Unique! 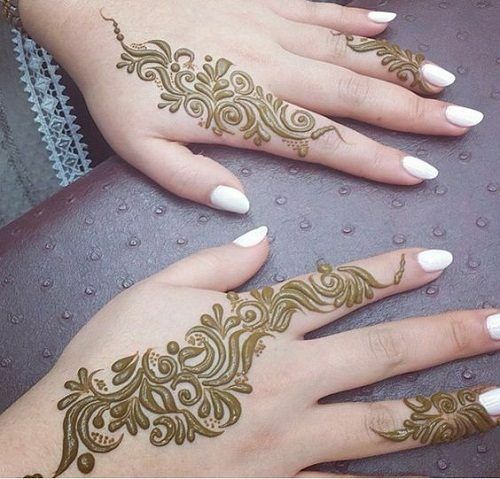 The fascination towards Arabic mehndi designs has grown manifolds in the last few years! 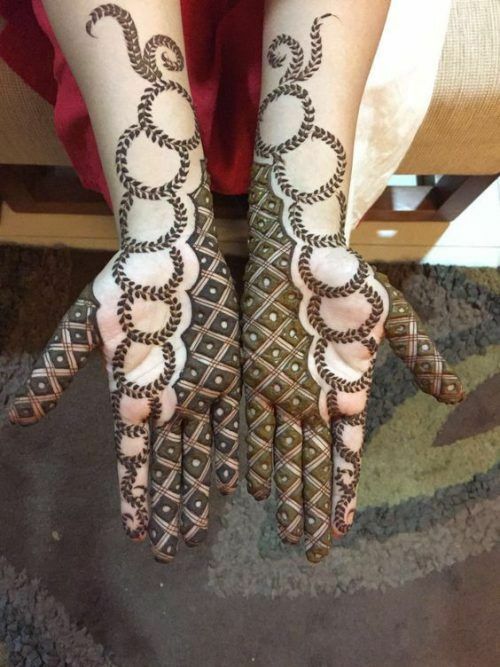 It gives a breath of fresh air to the traditional mehndi designs, with its modernity and uniqueness. 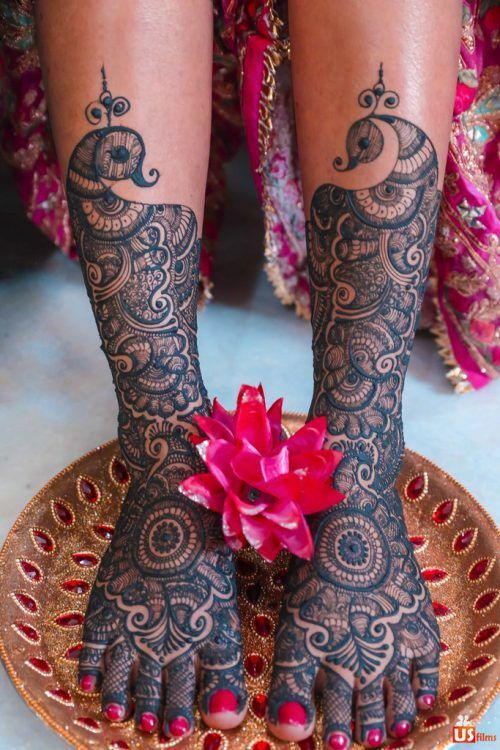 Arabic mehndi involves a mix of floral artwork along with geometric patterns, resulting in gorgeous, bold designs. 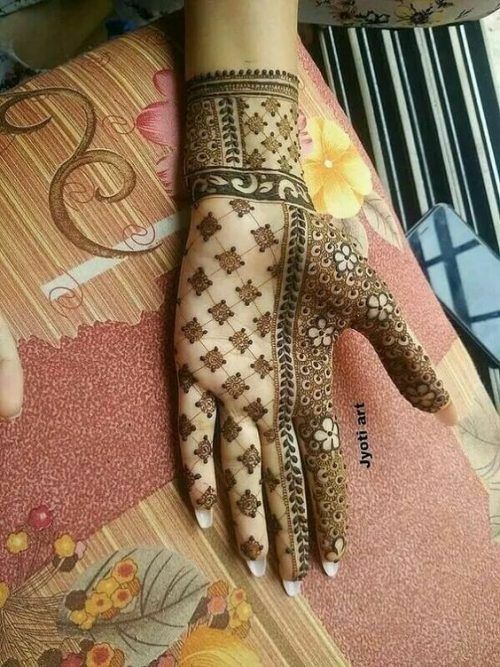 Every day we stumble upon interesting mehndi designs, on the basis of creativity. 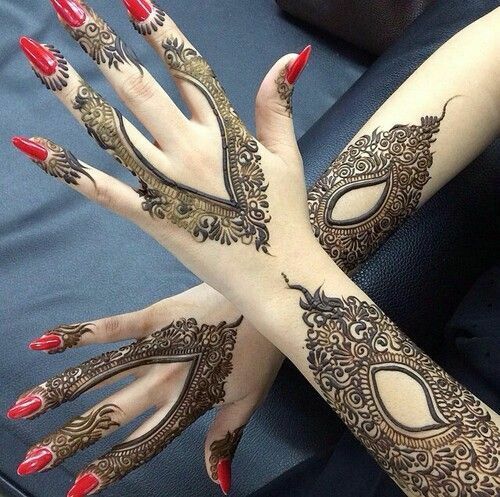 Arabic mehndi is the easiest to apply, hence, it's more popular amongst the modern brides. Since it's less complicated to be designed, it exhibits a very minimal and elegant vibe. 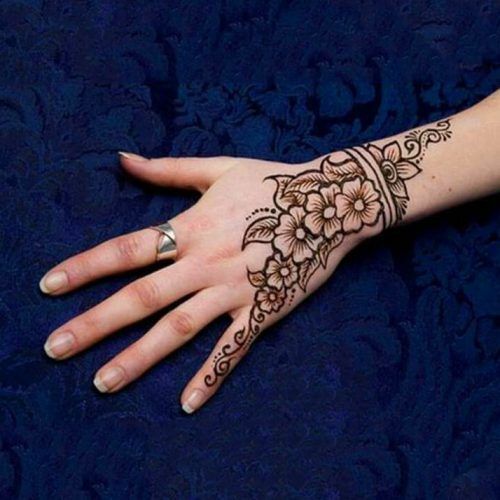 In order to leave you awestruck, we've lined up few stunning Arabic mehndi designs. Time to save some inspiration ideas!! We love how this design is a mix of details with spaces! It gives an illusion of being fuller despite minimal. If yours is an intimate wedding and you don't wish to go overboard with the mehndi design, then this one is a perfect choice for you! We haven't seen a lot of brides incorporating glitter in their mehndi! Though it's temporary but would be visually appealing, to say the least. Psstt.. .You can also match the same with your lehenga color. We know this one's quite simple but it would look really beautiful at nuptial ceremonies like Roka, engagement and more! Extensively detailed on the fingers with little design on the palm. Rich look, indeed! 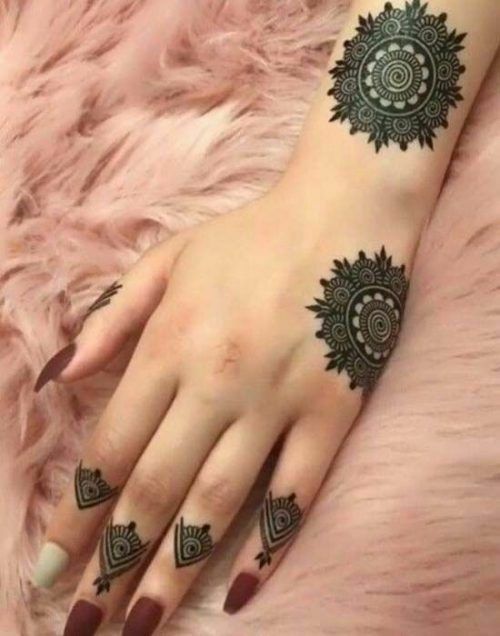 This is one of those Arabic mehndi designs which may look easy at first glance but is actually created with eccentric patterns! In short, it's an eccentric design with an unconventional punch. Perfect for your bridesmaids!! This design is all about a beautiful presentation of leaves and dots! 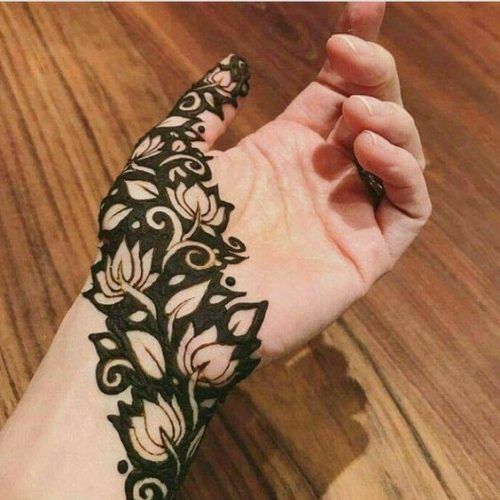 Since Arabic designs involve thick mehndi, this design would look really rich once the color sets in. While we all have seen traditional jaali designs, but this one's more effortless! It involves no other complementary patterns, thus bringing the entire attention to the beautiful jaal details. This one exhibits a magnificent vibe, doesn't it? The bracelet design around the wrist going all the way towards the middle finger, look like a gorgeous haathphool! Here, the design is creatively drawn with extensive use of beads! The mandala adds an enchanting vibe to the design and the fusion between these two makes it one of our favourites. 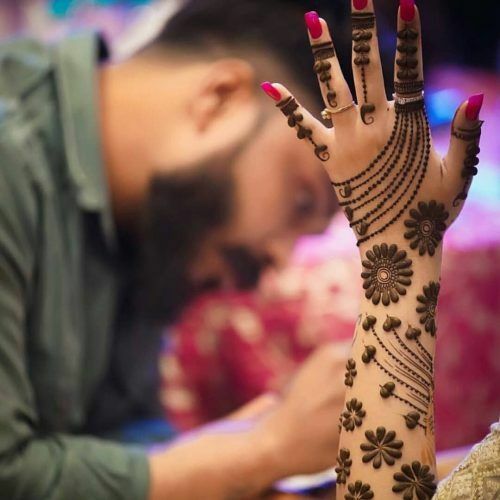 Portrait mehndi is trending a lot these days! 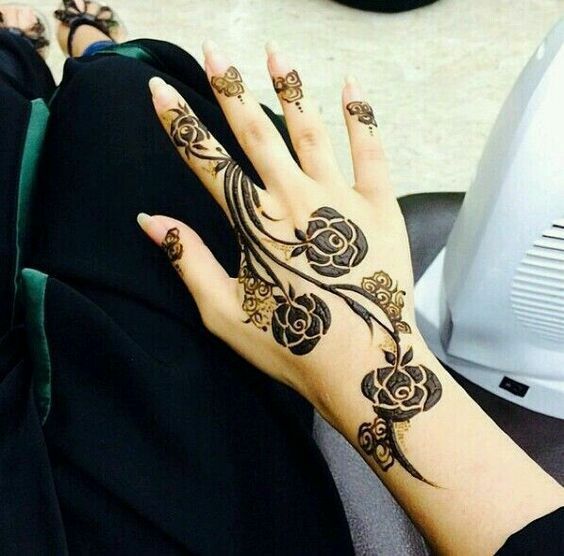 While it looks nice in traditional mehndi design, but with Arabic mehndi, it looks more prominent and neat. The one above is an innovative design that also exhibits a modern vibe. 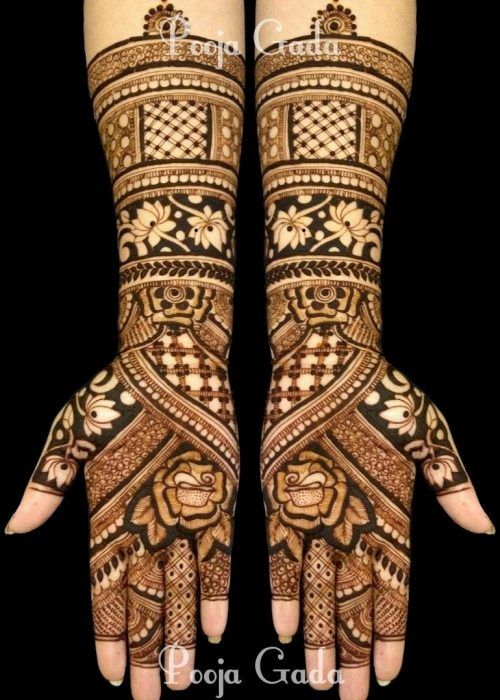 This design consists of various layers of mehndi illustrations! It is intricately detailed with a mix of patterns like rose, lotus, jaal and more, and will look stunning with the black stain. 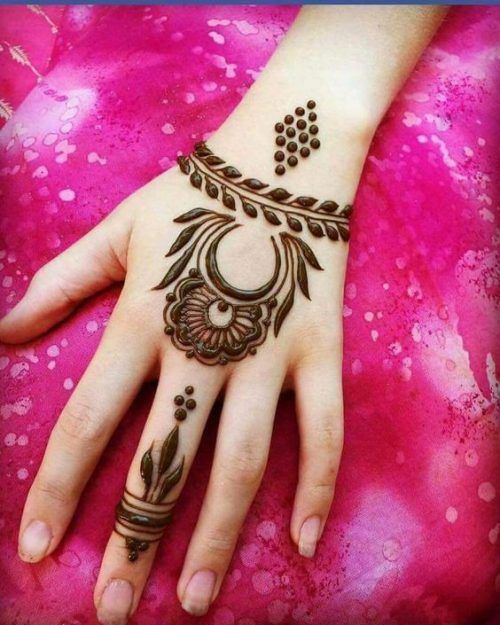 The highlight of this design is the elaborate motifs that accentuate the hand. In short, an interesting pattern that surely is a sight to behold! A floral vine running from the wrist to the index finger attached with dotted strings gives an ornament like appeal. Though it's minimal but very eye-catching! 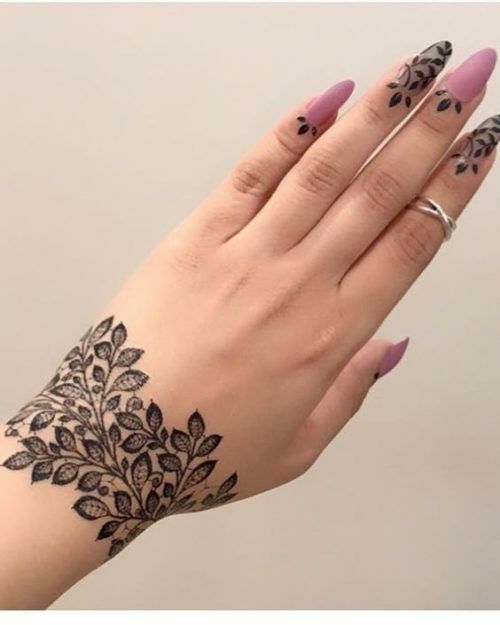 While the design is of a typical floral pattern, but it's created along the lower surface of the hand! So if you're someone who doesn't prefer mainstream patterns then this one is apt for you. 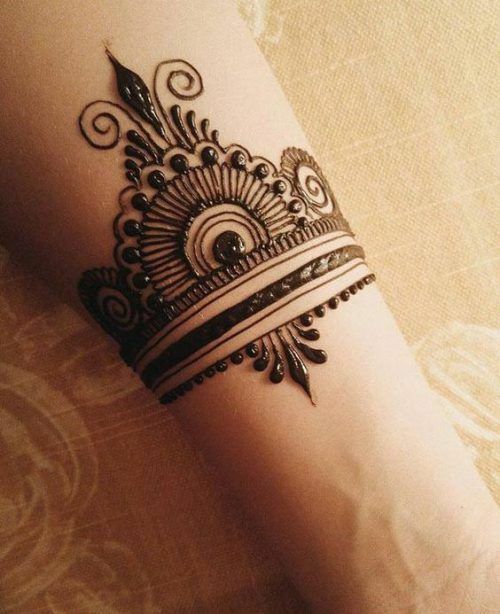 It's an amazing tribal tattoo-like, geometric patterned Arabic mehndi design. 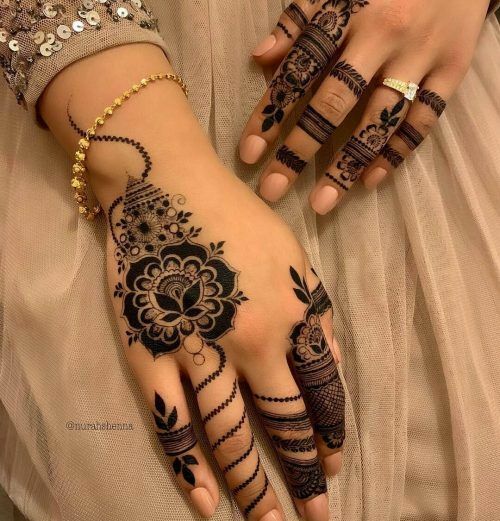 Looks the best when designed in black mehndi. Visually appealing! 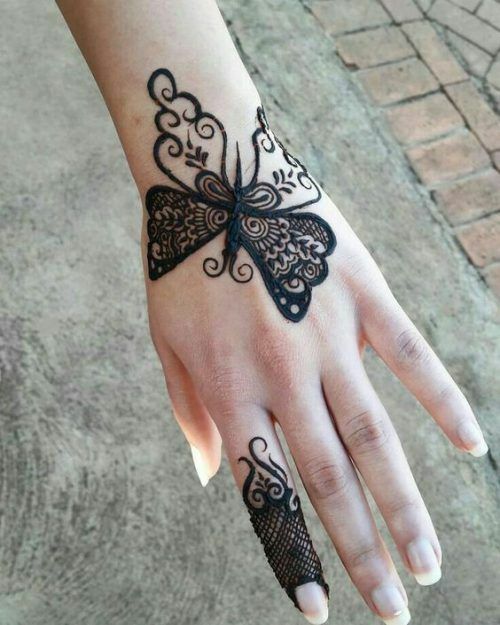 This design around the wrist looks so breathtaking! 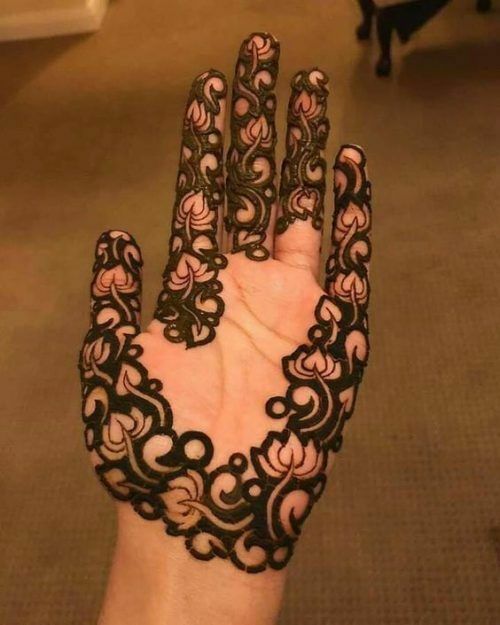 In case you don't wish to get henna drawn on your hands, you've found the perfect substitute. Also, it's really easy to make! 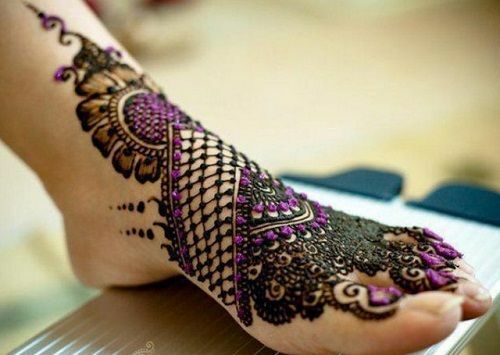 Do you prefer heavily detailed mehndi on your feet? Then how about giving this design a shot! The deeper application is done all over the feet and calves, making it a lot more alluring. How about going extra on the hands and keeping it minimal on the feet? 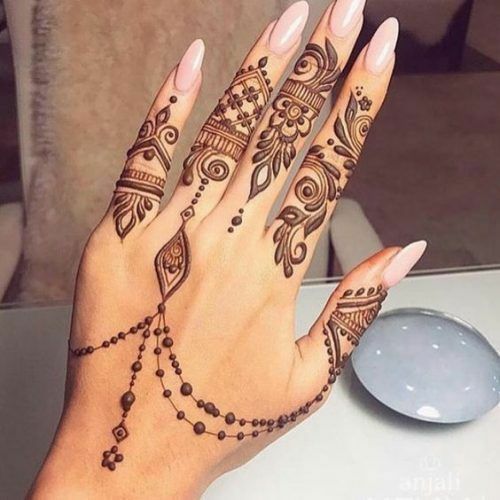 Well if that's the plan, then you should consider this Arabic mehndi design. 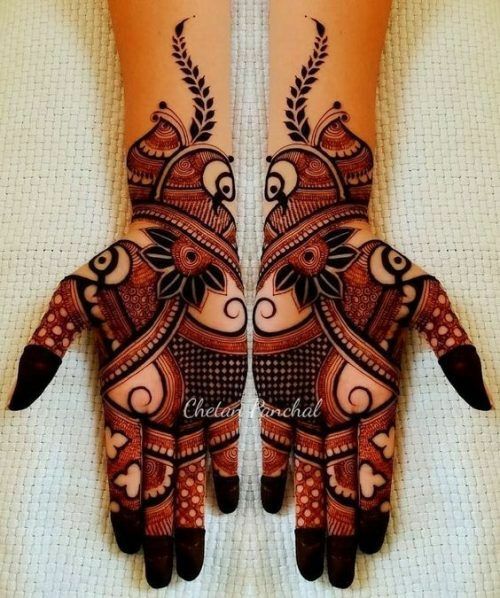 Who would have thought that a mehndi pattern with just one design would look so enticing? Thick floral motifs all over the hand look simple yet attractive. This one's absolutely gorgeous! It's elegant, extremely detailed and very feminine. This modern design would look amazing at any occasion and needs a lot of expertise to be created. 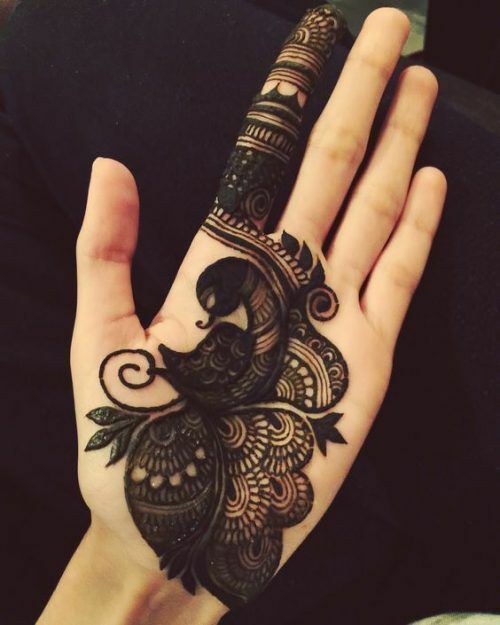 Arabic mehndi design goes hand in hand with a peacock pattern! The designs above are brilliant examples of the same. Someone who is not an expert can also make a peacock design easily. This one is a mix of mesh with floral/ leaves pattern. 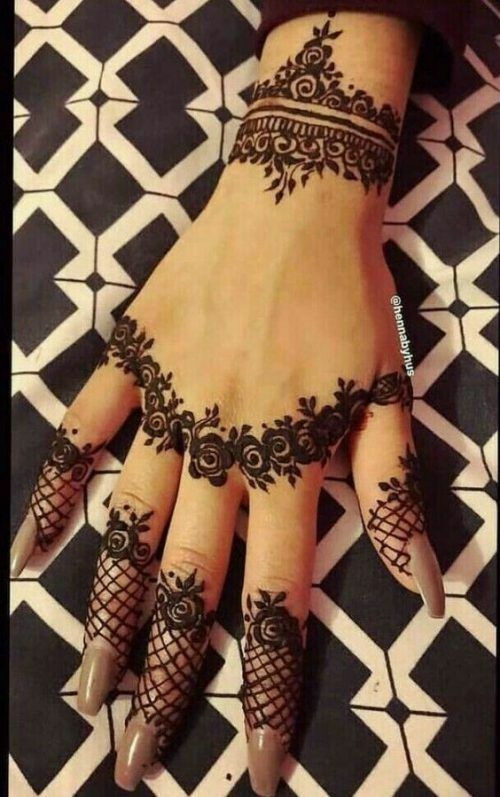 It proves to be a stellar example of out-of-the-box Arabic mehndi designs. Unique, to say the least! Woah! This one is definitely for the millennials. 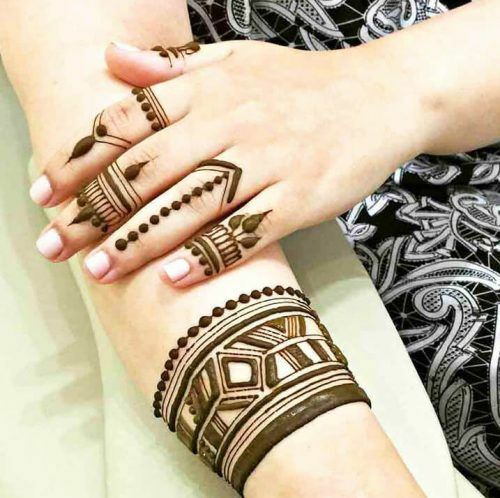 It is the newest trend in Arabic mehndi art, and one cannot help but give it a try. Thanks to its sheer beauty! Two totally opposite patterns featured together. It's the simplicity of this design which makes it popular amongst modern women! Don’t they complement each other perfectly? This one's just about foliage! Little leaf branches scattered around the hand and forearm. Definitely a fresh design, which is also extremely beautiful. An English rose vine along with basic mesh looks really elegant. It's an amalgamation of both traditional and modern vibes. You won't be able to resist this one! We love how unruly this design looks! The swirls and twirls created while incorporating the lotus pattern makes the design undeniably enchanting. 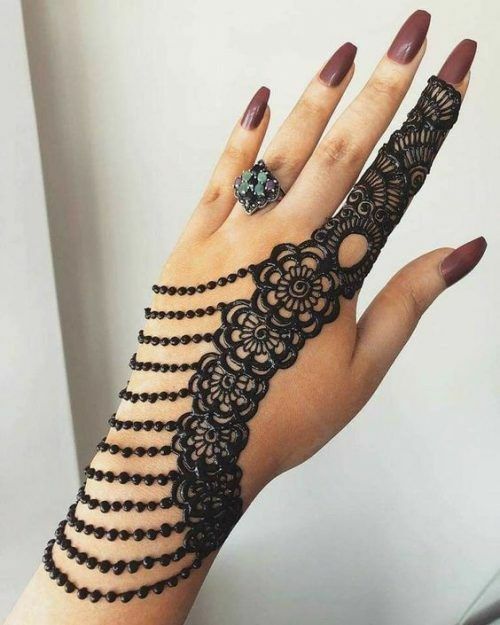 Don't we all just love intricate, full hand designs? Despite being rich, this design doesn't look cluttered. You won't require artistic skills to create this one. Ideal for the new-age brides! Palm cuffs became quite a rage a few years back! Now that the trend has declined, we decided to add a mehndi design which gives an impression of that jewellery piece. We love how this one display patterns like lotus & leaves with so much panache. In this pattern, a large portion of the hand is kept empty! The design on fingers will gorgeously accentuate your manicured nails that'll leave everyone around in awe. An inspiration worth saving! 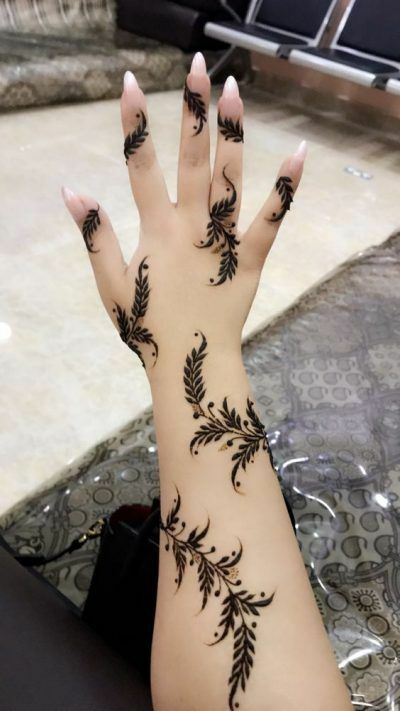 Aren't those some really amazing Arabic mehndi designs? Can't help but fall in love! 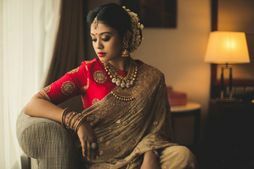 So, if you're a bridesmaid and you have a mehndi ceremony to attend, then you've got a plethora of trendy options to choose from. 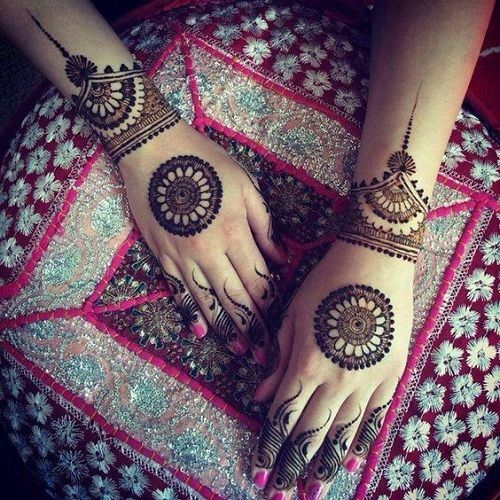 And if you're a bride-to-be then how about hosting an Arabic mehndi ceremony?! Innovative, to say the least. 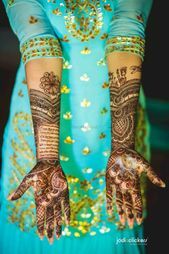 We have many more beautiful mehndi designs for you to browse! 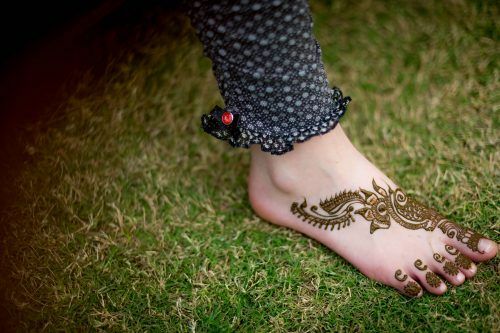 15+ Mehendi Designs For Your Feet: Designs, Ideas and More! 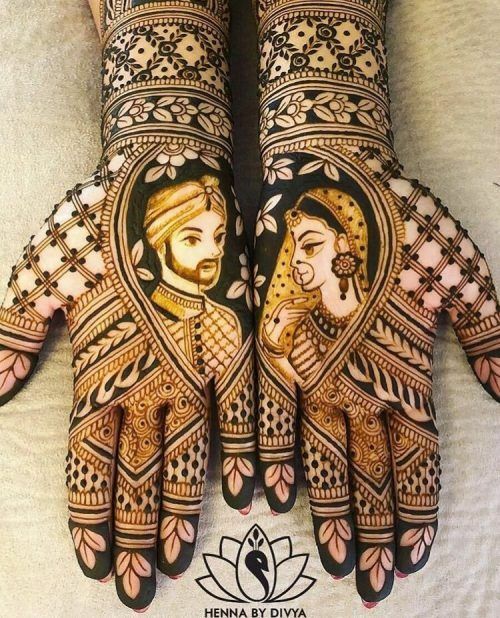 3 New Mehendi Designs To Try This Wedding Season! 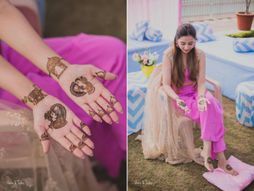 New Mehendi Designs For The Minimalist Bride!